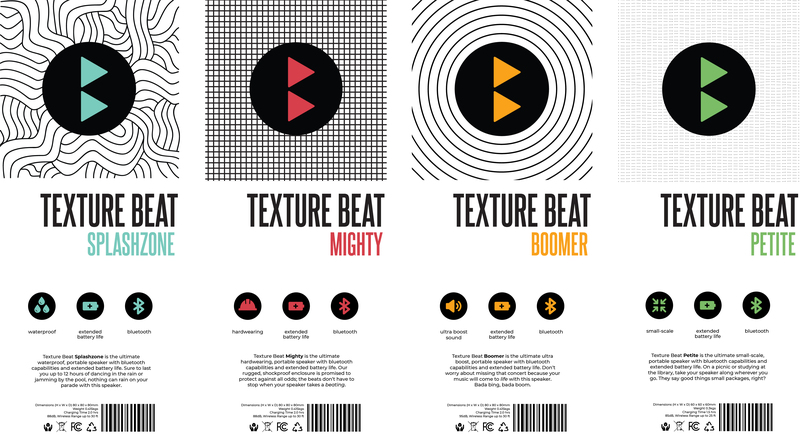 I picked two random words out of a hat with the intention of creating a concept for a company; my two words were "texture" and "beat" which I turned into a brand for speakers. I designed a cohesive identity system to communicate my concept, which included a: logo, color palette, typography, and tagline. I then took my concept and designed four boxes intended to house a line of speakers with different features. I created the designs on Adobe InDesign and then constructed them for presentation. Materials included: laser printer, Bristol paper, X-Acto knife, Elmer’s glue, bone folder tool.